Ahead of the July 1 free agent deadline, we’re kicking off our Sasha WatchⓇ coverage (and plenty of panic and alarmism, too). Sasha’s agent seems like a complete and utter tool, so we don’t listen to him. And since Sasha’s been hit in the head so many times by that gold medal, we’re not sure we trust what he says either – in any language. 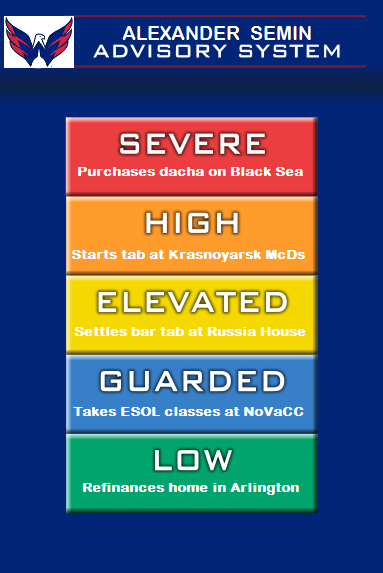 So to make things simple for Semin fans worldwide (and the shadowy #SashaMafia), we’ve developed an easy-to-use system to track where things stand on any given day. Caps fans know where we stand: Мы стоим с Сашей. This entry was posted in Washington Capitals and tagged 28 is GR8!, Alarmism, Alexander Semin, Maybe it's best we never bought a Sasha jersey, Sasha Watch. Bookmark the permalink.